There are at least 10 species of tiny blue-ringed octopuses, which, ironically for their size, are the most deadly of all cephalopods. Two well-known examples are the lesser (Southern) blue-ringed octopuses, Hapalochlaena maculosa (Hoyle, 1883), and the greater blue-ringed octopuses, Hapalochlaena lunulata, (Quoy and Gaimard, 1832). The common name comes from the bright blue rings that appear when they are alarmed. Lesser (Southern) blue-ringed octopuses, Hapalochlaena maculosa, are the larger of the two and more common. When alarmed, they display smaller blue rings (hence the name “lesser”) that generally measure less than 2 mm in diameter. They weigh only 28 grams with bodies to 5 cm long and arms to 10 cm. The dorsal (upper) surface of their mantle usually has a rough appearance covered by numerous irregularly arranged wrinkles. There are also fine, unevenly-sized tubercles covering the head and mantle. While resting, the background color is a uniform gray to beige, with large, light brown patches or maculae — thus the name H. maculosa. On their dorsal mantle, 10 maculae form a pattern of brown chevrons. Smaller patches dot their web and base of their arms. All eight arms are marked with approximately 10 evenly spaced brown patches that form bands running down their arms. Their blue rings are usually not visible in animals at rest. When the octopus is agitated, the brown patches darken dramatically, and iridescent blue rings or clumps of rings appear and pulsate within the maculae. Typically 50-60 blue rings cover the dorsal and lateral surfaces of their mantle. Blue-ringed octopuses, Hapalochlaena maculosa, can be found only in the temperate waters of southern Australia, from southern Western Australia to eastern Victoria at depths ranging from 0-50 m. Hapalochlaena lunulata can be found in shallow reefs and tide pools from northern Australia to Japan, including Papua New Guinea, Solomon Islands, Philippines, and Indonesia and as far west as Sri Lanka at depths ranging from 0-20 m.
Blue-ringed octopuses feed on small crabs, hermit crabs, and shrimp that it hunts during the day. Two types of venom secreted by two separate venom glands are used against prey and predators. One of the venoms is used for hunting crab, the other, which is extremely toxic, is used as self defense against predators. The venoms are secreted into the blue-ringed octopus’s saliva, but the mechanism for poisoning its victim is not well understood. Either the venom is expelled in the saliva into the water or the octopus bites its prey or predator. Once the prey is dead, the octopus begins consuming it with their powerful beak-like mouth. 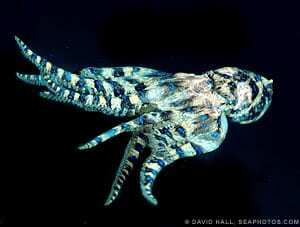 The mating ritual for blue-ringed octopuses, H. maculosa and H. lunulata, begins when a male approaches a female and begins to caress her with his modified arm, the hectocotylus. Males then climb on the females back, at times completely engulfing the female’s mantle obstructing her vision. The hectocotylus is inserted under the mantle of the female and spermatophores are released into the female’s oviduct. The female then lays between 50-100 eggs and guards them by carrying them under her tentacle until they hatch about 50 days later into planktonic paralarvae. The female then dies as she is unable to eat while she guards her eggs. The blue-ringed octopus is about the size of a pea when hatched then grows to reach the size of a golf ball as an adult. They mature quickly and begin mating the following autumn. Males die after mating. 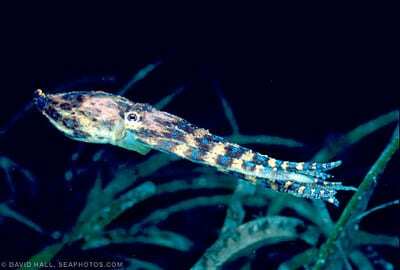 Octopuses, along with squid and cuttlefishes have a short lifespan of about 2 years. When the threat is unavoidable, blue-ringed octopuses eject a neuromuscular venom that contains maculotoxin and tetrodotoxin which cause paralysis. This poison is fatal and more potent than any poison found in land animals. Human victims can be saved if artificial respiration begins quickly; however there is no known antidote and the only treatment is ongoing heart massage and artificial respiration until the poison dissipates (usually in 24 hours with no ill-effects). Symptoms include: nausea, vision loss and blindness, loss of senses, loss of motor skills, respiratory arrest. This species lacks an ink sac and has therefore become a common addition to the marine aquarium. Toxicologists strongly disagree with this practice because of the potential danger to people who are unaware of the potentially fatal venom. 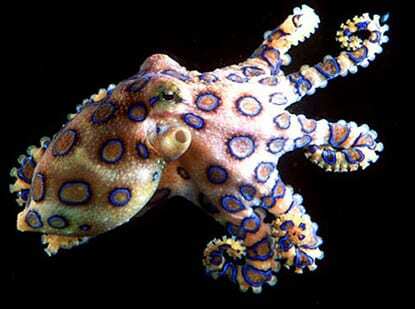 So why should you NOT buy a blue-ringed octopus?